Mr. Silverman is founder and owner of Voluntary Disruption, a division of Silverman Benefits Group (SBG). He is an Amazon “Best Selling” Author featured in the new book: Breaking Through The Status Quo, and he’s also EBA magazine’s 2017 Voluntary Adviser of the Year. Visit voluntarydisruption.com. In the first two parts of this series, I’ve discussed how the most influential disrupter to the enhanced benefits industry must be the willingness of the broker community at large to adjust, adapt, and embrace our ever-changing market. In essence, brokers must position themselves as either an innovator who drives the change or an adopter who follows those innovators and helps to steer the change. The bottom line remains firm; whether you choose to outsource your enhanced benefits strategy to one specific carrier, bring it all in-house, or partner with a carrier agnostic firm, you must be proactive and intentional with whatever approach you choose. Hopefully by now, you’ve already started your due diligence to examine and evaluate which of the enhanced benefits strategies I’ve been discussing will be the best fit for you and your firm. Furthermore, I hope you’ve started to have proactive conversations with your clients to ensure they have a properly aligned enhanced benefits plan in place that complements your recommended overall healthcare strategy. In Part 2, I discussed a number of products and services that are available within the marketplace and specific and purposeful questions that should be asked of not only yourself as a benefits broker, but questions that should also be asked to your clients. Remember, the emphasis to your clients must be consistent and deliberate – that you’re looking to eliminate benefit redundancy, and any wasteful employee overspend that may have occurred during any prior installation of enhanced benefits products that were implemented with little regard to the total healthcare strategy you and your client have thoughtfully put together. That’s the basic conversation I have multiple times a week with health brokers across the country who readily admit they’re losing money to carrier reps and other brokers who are cold-calling their accounts daily and adding products regardless of the healthcare strategy in place. Further, they are increasingly recognizing that competitive health brokers are using properly conveyed enhanced benefits as an “in” to take over the enhanced benefits that are already installed, thus getting their foot in the door. This methodology also allows your competitors to quote your client’s group health insurance and provide alternative solutions before their health insurance renewal. If these scenarios alone don’t cause you fear as a health broker who may be ignoring the enhanced benefits space, I don’t know what else will. Most health brokers tell me they don’t have the “man-power” and in-house labor to handle multi-location enrollments with their clients all over their area, let alone those with locations all over the country. These same health brokers realize that if they have larger accounts, they can outsource to an enrollment firm, but they admit they don’t want to give up 80-90% of their total available compensation, thus they have widely ignored the discussion of enhanced benefits. Conversely, for the majority of health brokers who don’t have larger clients, they believe that finding an enrollment firm to handle their enrollments is a herculean task; and for the large part, they’re right. One of the biggest services that a strong enhanced benefits partner can provide is their ability to handle inner-state and multi-state enrollments because they have a large bandwidth and a national presence to help accordingly. Further, and when needed, your enhanced benefits partner can also enroll what most health brokers call the “core,” as described previously, and an extraordinary enhanced benefits partner will actually do so at no cost to the health broker what-so-ever. When surveyed, most health brokers believe that only a very small percentage of their clients already have enhanced benefits installed from a carrier rep or another broker. When’s the last time you scrubbed your entire book of business to see which of your clients have enhanced benefits already, what carrier they’re with, and what benefits are installed? When selecting an enhanced benefits partner, be sure they have the ability to scrub your entire book so you know exactly where to focus your initial efforts. Let’s say you’re a health broker that has proactively introduced and installed enhanced benefits over the years; when’s the last time you had an independent firm audit your commissions and carrier contracts? I can tell you many stories of health brokers who thought they were doing the right thing and assumed they were getting paid fairly, only to find out the reason they don’t perceive there to be much money in the enhanced benefits industry is because they weren’t paid as they were supposed to be. How many times have you had a carrier rep tell you that they’ll pay you 30%, 40%, or even 50%? As great as that sounds – 30%, 40%, or 50% of what? Most health brokers have no concept what number their percentage of compensation is coming from. Most are told they have the “best” broker contract available by the carrier – sadly however, once they have their compensation and contracts audited, they quickly realize they were actually set up with an average (at best) contract and many times, find out they weren’t even paid properly on that. Remember, complete carrier compensation transparency is paramount – a true disruptor within this space. Your partnering firm must hold top carrier contracts with volume based carrier underwriting concessions that extend to you, your brokerage and of course, your client. Do you have broker competitors in your area who are larger than you and use their size as a marketable advantage when they prospect? When you’re prospecting large account clients, do you find yourself competing directly with the “top 50” brokerages around the country? Imagine if there was a way that you could change your client’s perception of your firm’s size without signing any new office leases and going on a hiring spree. I’m a firm believer in the idea that perception equals reality – how one perceives you, whether accurate and true or not, is their reality of who you are and what your capabilities are within the marketplace. When deciding upon which type of enhanced benefits partner you want to work with, ask them about their ability to “white label” and brand all of their brokerage and client facing services to match yours. By implementing a white labeled approach, you’ll be able to differentiate your business while changing your client’s perception of your firm’s abilities based on size, scope, and bandwidth, while also leveling the playing field to compete directly with the larger firms who try to use their size as an intimidation factor for why larger accounts shouldn’t work with smaller regional based firms. 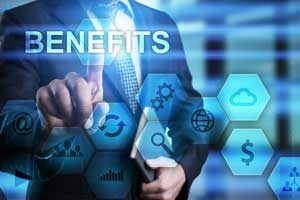 If you’re struggling with getting your clients to understand the need and value of a properly designed and installed enhanced benefits package, perhaps it’s your wording that is stymieing your ability to garner client interest. What terminology and verbiage do you use when describing, what I call, enhanced benefits? How do you advise your clients to implement enhanced benefits? If you’re part of the majority who’s still using “voluntary” and “ancillary” – it’s okay, the good news is that you still have time to change and disrupt your own practice for the better. Remember, the commonly used word choice that your competitors are using, voluntary and ancillary, insinuate “unimportant” and “non-essential.” Change your vocabulary and you’ll have an immediate and disruptive impact on your ability to maximize revenue while providing your clients a next generation benefits package like non-they have ever had before.